I finally saw the movie Carol a week or so ago. My friend, Elizabeth, and I both loved it. And we decamped to my favourite Indian restaurant to enthuse about it afterward. The acting is superb. I loved Cate Blanchette and Rooney Mara. But it was the cinematography, the opulent shots of city streets or roadside motels, yearning looks out of car windows, surreptitious sideways glances, smoulderingly evocative half-smiles which kind of left me breathless. As Tim Robey of The Telegraph says in his review of Carol... director Todd "Haynes makes unhappiness beautiful." So... yeah. The movie is beautifully filmed. There was that. That and the clothes. Sigh. The clothes. 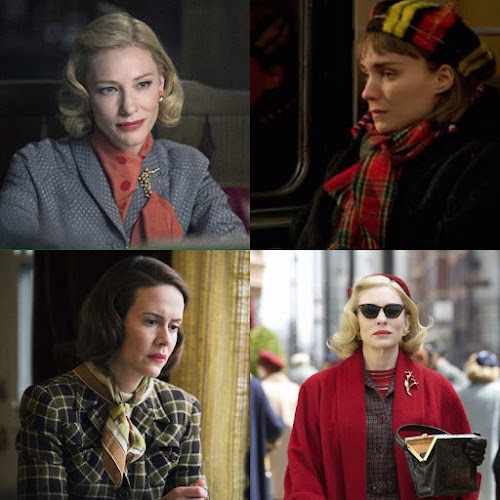 The costumes in Carol are stunning, I think. 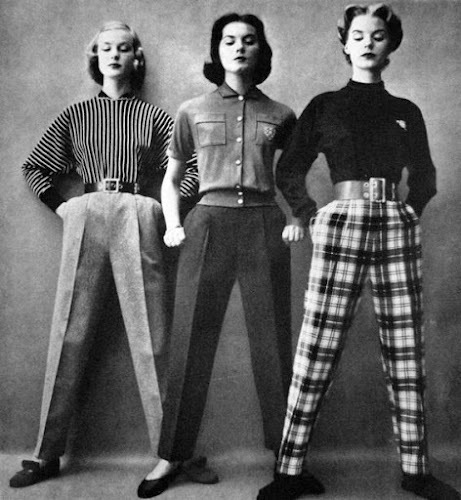 But then again I love the fashion of the fifties. I am a fifties girl after all. Born in the fifties. And in my fifties... even if only for a few more months. 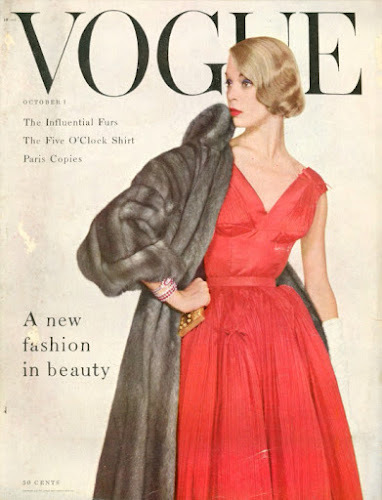 I've rapsodized about fifties fashion on the blog before (here and here), about vintage fashion or current looks that riffed on vintage fashion. And with the exception of the hats of the twenties, I love the fashion of the fifties best. This burgundy suit from Vogue with the silk scarf tucked around the collar is the epitome of chic, don't you think? I love this shot too. Trousers with pockets, a sweater, and flats, is a timeless look. Blanchette wears pants like these beautifully in the film, especially as the road trip with Therese unfolds. I'd wear those plaid pants and mock turtleneck myself. I'd lose the belt, add my jean jacket, and be good to go. See? 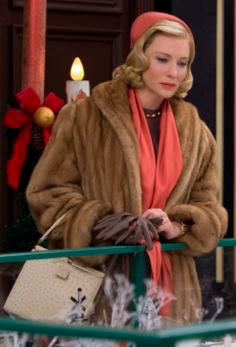 I love that coral hat and scarf on Cate Blanchette. Doesn't she remind you of Lana Turner in that outfit? Or Grace Kelly? And that bag. I remember when I was a kid, my mum's bags always snapped shut with a satisfying click. 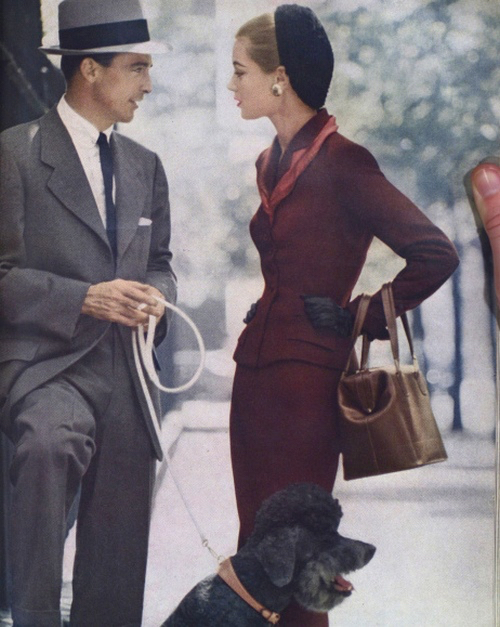 That way a lady could remove her gloves, place them into her bag, tap out a cigarette, and snap the bag shut with elegant and confident élan. I love a period movie. There's nothing like reliving the past on the big screen... full immersion in another age for two whole hours, so to speak. 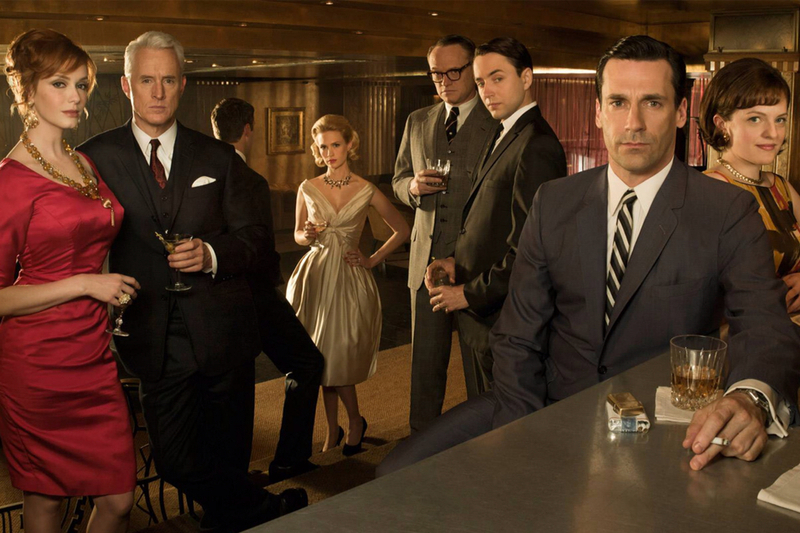 But we've been reliving the fifties and early sixties on the small screen, too. I know many of you were devastated...okay maybe disappointed is a bit more realistic... when the very stylish Mad Men wrapped up last spring. But if you're looking to scratch that vintage clothing itch, to ogle some fifties fashion, it's not the only game in town, you know. 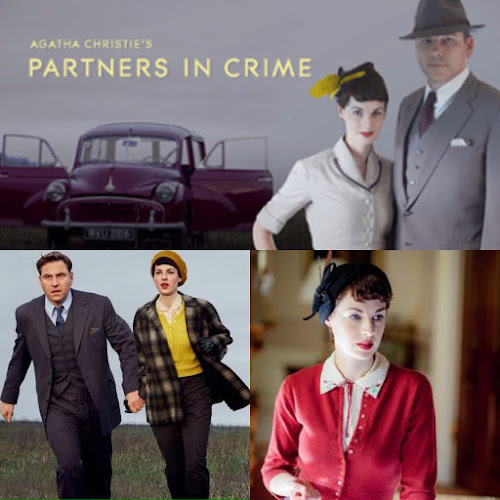 Hubby and I love the new TV series Partners in Crime, based on the Agatha Christie "Tommy and Tuppence" mystery novels. The books take place in the twenties, but the television version is set in the fifties. Tuppence is adorable in her hats and cardigans, slim suits, and slacks and plaid jacket. 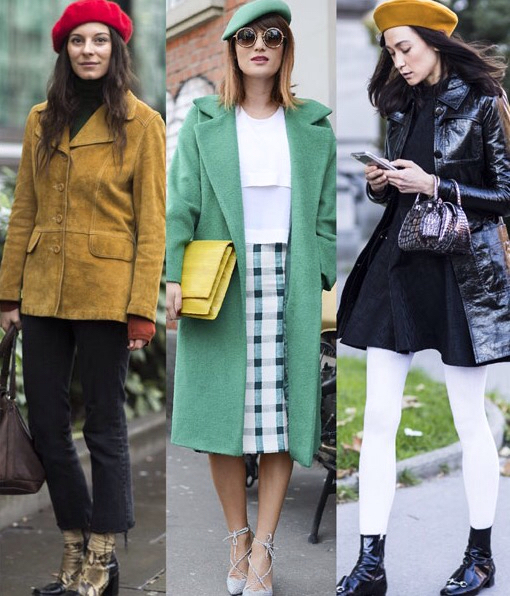 I'm particularly fond of the yellow sweater and beret. Hubby and I really enjoy the Partners in Crime mysteries, but then we haven't actually met a British mystery show we don't love. And I have to admit it's created some serious hat envy for me. These shots below from Netaporter's magazine The Edit are a good example of life imitating art, don't you think? Even if the wearers of these hats have never watched Partners in Crime, those berets look like pure fifties fashion to me. 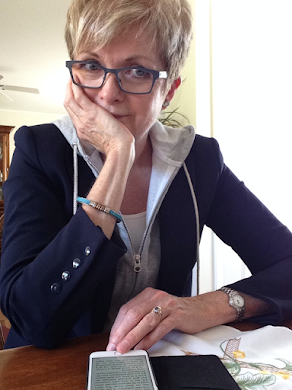 And according to Alyson Walsh who writes the blog That's Not My Age... the cardi is back this season. Hmmm. I might look for a lovely yellow or red cardigan, like Tuppence's. 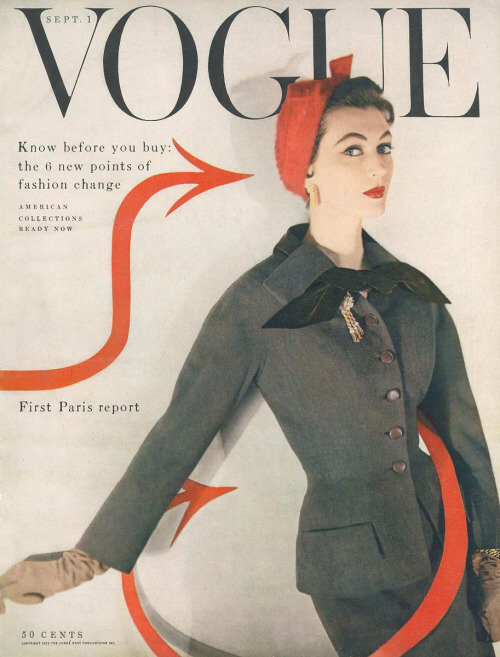 I could pop on a beret and a couple of vintage brooches and be the very epitome of mid-century chic. 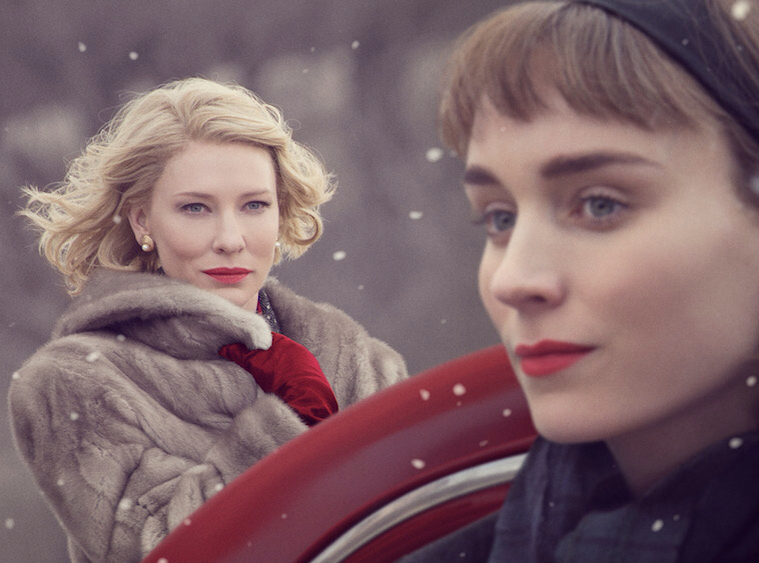 IIf you haven't seen the movie Carol yet, you should. If only for the clothes. The cars. And the wonderful period settings. 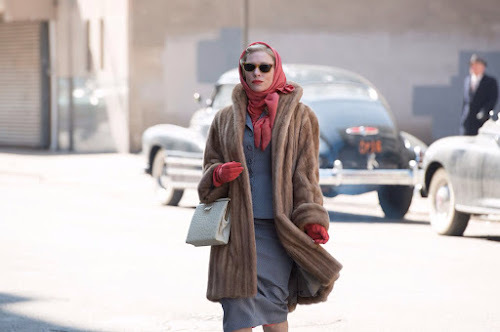 Check out this article by Jeremy Allen which analyzes the "Cars and Clothes of Carol," as well as some of the settings in the movie which was filmed in Cincinnati. Apparently Cincinnati looks more like 1950's New York, than New York itself. 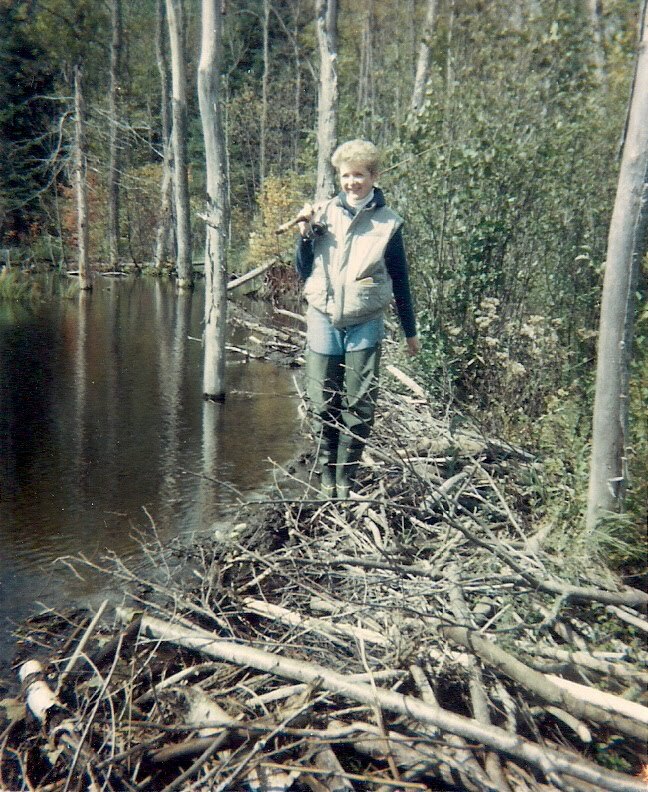 I'm at my mum's in New Brunswick this week. We scoured all her old photographs looking for shots of fifties fashion. She has lots of pictures of her sisters and herself in the forties. But by the mid-fifties Mum had four kids and undoubtedly not much time for picture taking. I do have a 1958 photo of my two older sisters in their matching skirts and blouses, crinolines and all... but it's in my album at home. Ah well... I'll include it in another post. I'm quite happy to be at home in New Brunswick just now. Not just because Mum and I are having a good visit... but also because Hubby is back at home (too many homes) in Ottawa "battling" (his word) a mouse in our kitchen. And because they've just received over fifty cm of snow. By the time I swan in later this week, the roads will be well cleared and the ski trails freshly groomed. I hope. Now that's a coincidence, isn't it? Fifty centimetres of snow. Fifty. Fifties fashion. I'm in my fifties. For a while yet anyway. But I'm trying not to think about that too much. I'm not so sure that you have totally avoided our snowmageddon - I hear there will be more next week! Rear Window is one of my favourites... Love Grace Kelly's outfits in that film. Especially a mint green confection...if I recall correctly. Ha ha... Love that you noticed that I used 'swan." Yes...I loved Blue Jasmine as well. But so sad and a bit too much like Streetcar Named Desire. I haven't seen the Tilda Swinton one. I will keep my eye out for it. Thanks for the post -- so fun to see the other sources you've pulled in to compare to the movie stills. Good call... "tension between aesthetic gorgeousness and emotional constraints." Love that. Wish I had said that. The scene where Carol is at dinner with her husband and in-laws is a good example of constraint, restraint, repression etc. It made me feel claustrophobic listening to them talk about Carols' enforced psychiatric treatment over dinner. Gad what a crazy mixed-up world we were born into. I know what you mean about how fifties fashion suits curvy figures... just look at Elizabeth Taylor. In that white dress in Cat on a Hot Tin Roof... nobody does a dress better that Liz, in my opinion. I just checked out your post from last summer again...I remember reading it at the time. I think you will love the movie, if you see it. I really wanted to see Carol anyway, but now that I know it's a fashion show too .... I can't wait!! Have fun with mom. ( I miss mine every day.) Looking through old pics is the best.